Mumbai, October 10, 2015: Maharashtra National Law University Mumbai (MNLU) today celebrated its 1st Foundation Day Celebration at Tata Institute of Social Sciences (TISS). The celebration was graced by Shri. Devendra Fadnavis Hon’ble Chief Minister of Maharashtra and Shri. Vinod Tawde Hon’ble Minister of Higher & Technical Education. MNLU is the first law university for the State of Maharashtra, and is currently offering courses such as BA, LL.B Hons. Five year integrated program and one year LL.M (Legal Pedagogy and Research) program. The university has received a very positive response of around 3000 applications for its opening batch. The classes for this batch are already under way. 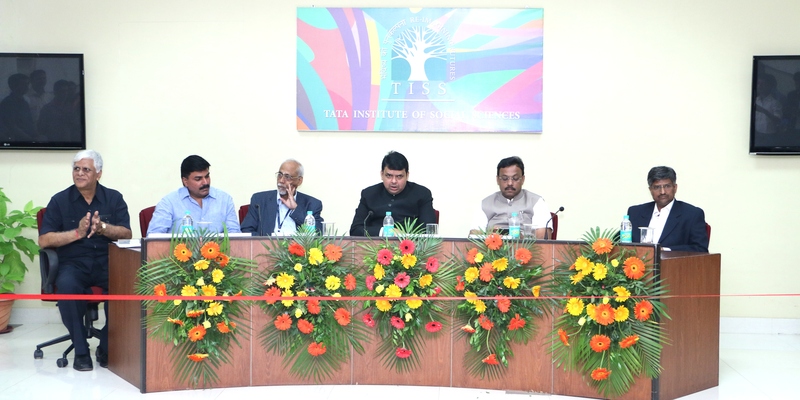 MNLU is currently housed and is temporarily being operated from Tata Institute of Social Sciences (TISS) campus until an independent and new campus for “Maharashtra National Law University Mumbai”. The MNLU students have been offered the same facilities as TISS students. The students also have access to TISS library for their research/study purposes. Shri. Vinod Tawde Hon’ble Minister of Higher & Technical Education expressed his desire that MNLU should include certain other novel disciplines such as International Maritime law and International Humanitarian law. He also assured the students that MNLU will celebrate its next Foundation Day at its own campus and congratulated them on the launch of its maiden newsletter, “Nyūsuretā” (means newsletter in Japanese).